Gabriel Johnson’s header eight minutes from time gave Brighouse Town a 2-1 win away to Carlton Town yesterday. It was the Calderdale side’s first trip to the Nottingham club and gives them seven points from four games in the Evo-Stik NPL East this season. 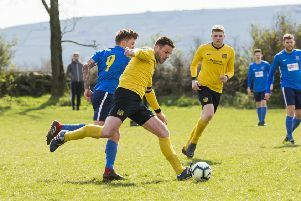 Brighouse got a boost mid-way through the first half, in front of only 67 spectators, when the home side’s Kerian Walker headed into his own net from Iwan Heeley’s ball into the danger zone. Carlton were soon on terms through Ben Hutchinson six minutes later but Johnson had the decisive say after Jack Normanton’s effort had come back off the bar. The ball was saved by the home keeper but the referee, after consulting one of his assistants, ruled that it had crossed the line. Brighouse, who looked the better team but had late scares, now get a week off before three home games in eight days, starting with Loughborough Dynamo. Loughborough were 4-2 winners over Pickering Town yesterday in a clash of two sides previously without a point this season.